Die perfekte Lösung für Desktop-Verarbeitungsleistung und Widescreen-Grafikleistung innerhalb und außerhalb des Büros. Im Bereich Gehäuse kann das HP Compaq nc8430 mit einer guten Verarbeitungsqualität und hochwertigen verwendeten Materialien beeindrucken. Die Verwindungssteifigkeit als auch die Resistenz gegen Verformungen bei Druckbelastung hätte dennoch etwas besser ausfallen können. Den Eingabegeräten des Notebooks ist kaum ein Vorwurf zu machen. Sowohl das Touchpad und der Trackpoint, aber insbesondere die Tastatur zeichnet sich durch Übersichtlichkeit und Benutzerfreundlichkeit aus. Obendrein verfügt das nc8430 über einen Fingerprintreader mit dessen Hilfe sich diverse Passwörter schnell und easy durch ein Streichen des Fingers über den Scanner ersetzen lassen. Zwar war die Leistung des Compaq mit der getesteten Ausstattung nicht besonders umwerfend, mit den ebenfalls erhältlichen Core 2 Duo CPUs (bis zu 2.16 GHz T7400) sind dann aber erhebliche Leistungssteigerungen möglich. Die X1600 Grafikkarte erlaubt auch das Arbeiten mit Multimedia und CAD Anwendungen (FireGL V5200 im nc8440). All in all the NC8430 is a great buy. It has enough processing power to run business and CAD applications, and a GPU that runs most games very well. While not billed as a gaming machine, the x1600 puts it up near the top for all HP notebooks (actually, this is an HP Compaq notebook). The cool keyboard and top surface is rare these days, and the quiet fan does not disturb those nearby either. So far, this has been the best balance of performance, battery life, and appearance of any notebook I have seen. The HP Compaq nc8430 ($1,680 direct) has a lot of stature for a business laptop. When it comes to meeting work deadlines and taking on various projects, this powerhouse lives up to its reputation. The 15.4-inch widescreen display is a compelling reason to go with the nc8430. It lets you have three windows open at the same time (arranged so that each gets its own space) or gain several more columns on an Excel worksheet. If that isn't enough to meet your business requirements, then check out the system's Intel Core 2 Duo processor and discrete graphics. This is a powerful machine, no bones about it. Though the screen is dim, it chums through productivity apps like few notebooks we've seen. And it'll run for nearly three and a half hours between charges, making it the top pick for taskmasters or anyone who wants to watch a double feature on a long flight. Wired: CPU (2.16-GHz Core Duo) is extreme for this class. Don't tell your boss, but this "business" notebook dealt 71.7 fps on Doom 3. Serial hookup for connecting vintage accessories. Tired: Only three USB ports (most models have four). Smallish 80-gig hard drive. At first glimpse of the HP Compaq nc8430, you're likely to think it subdued. Like other HP business laptops, its black-and-gray case won't attract any envious stares at the airport, and its performance likewise doesn't necessarily stand out among the crowd of midsize business laptops. But look more closely, and you'll see the kind of features that matter for real productivity on the road: a sizeable display, a comfy keyboard, plenty of ports, and corporate-level security features. Price-wise, the nc8430 is competitive with similar systems, such as the ThinkPad Z61m, without undercutting them. It's neither the flashiest nor the fastest computer around, but if you're looking for a reasonably portable system for business, the HP Compaq nc8430 will help you get the job done. Overall, this is a very fine machine that has done much to impress both myself and my co-workers. While it does have its minor flaws, the notebook itself is build business-class touch. It delivers top notch gaming and processing performance while still maintaining a sleek and small profile for a 15.4" notebook. Most of the ports are positioned very well on the notebook, and its functionality is further enhanced with the Basic Docking Station. However, with power there comes great responsibility -- don't put this notebook on your lap and play a couple of high powered games. For general purpose activities the notebook is fine no matter where it sits, so feel free to check your email, play solitaire, and surf the net from your living room couch. And for the amount of power in this notebook, the battery life is also very respectable and can be further enhanced through the secondary battery options provided by HP. 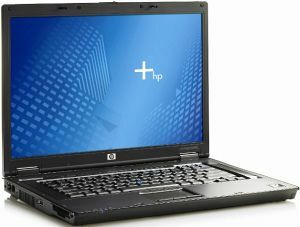 The following is a review for the HP Compaq nc8430, a business oriented mainstream notebook with a 15.4" screen. The nc8430 is currently one of HP's best selling business models with its great combination of power and portability. In conclusion the HP Compaq nc8430 is a great notebook. There are so many other mainstream notebooks out on the market today; choosing one is by no means an easy task. If you can afford the price of entry the nc8430 is a great choice. Few can match the combination of business class quality, gaming power, and portability of the nc8430 which makes it a real winner. T2500: » Weitere Infos gibt es in unserem Prozessorvergleich Vergleich mobiler Prozessoren und der Prozessoren Benchmarkliste .